When it comes to pursuing a lush green, weed free lawn it is natural to be concerned about the health and safety of your pets and the use of chemicals. 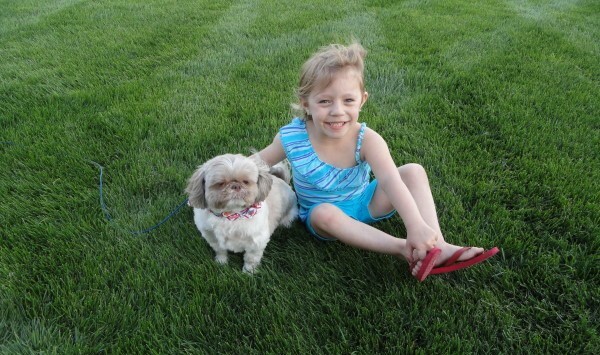 Pets are part of the family and the choice of a lawn care provider is an important decision. As pet owners too, we are always looking for pet friendly products to integrate into our programs and services offered. The good news for both of us with pets is that we do not have to sacrifice the idea of a great looking lawn to keep our pets safe. At TurfGator, we have many options available to control weeds and most fertilizers, herbicides and insecticides that we apply are not hazardous to pets and humans, and even less so after the product has dried. We do recommend that pets and children wait until the application is dry to reduce any potential contact. While drying times vary with environmental conditions, waiting 2 hours for bare feet and paws to return to the lawn is always a good practice. Our lawn care technicians provide written details, application specifics, date & time of treatment and recommendations following every service performed. Over 90% of pet poisoning from fertilizers, herbicides and insecticides are from when a pet consumes the product from open containers, improper storage or disposal of the containers. Hiring a reputable lawn care service provider can actually reduce these exposure risks. At TurfGator we take an Integrated Pest Management (IPM) approach for effective pest (insect, weed & rodent) control to avoid adverse effects on humans, domestic pets, wildlife and the environment. Our goal is to thicken your lawn and build soil chemistry which will naturally reduce weeds, insects and diseases so fewer products are necessary to maintain a healthy weed free lawn. Our lawn care technicians are licensed by the State of Illinois which ensures you that they have been properly trained and tested in applying products correctly and in the recommended safe amounts. If you have any specific concerns with your pets or would like to discuss all options available, please feel free to call our office at any time.